The biggest resort in the Maldives, Sun Island Resort & Spa, owned and operated by Villa Hotels is a place where nature collides with luxury giving its guests the best of both worlds: a desert island experience and indulgent luxury. 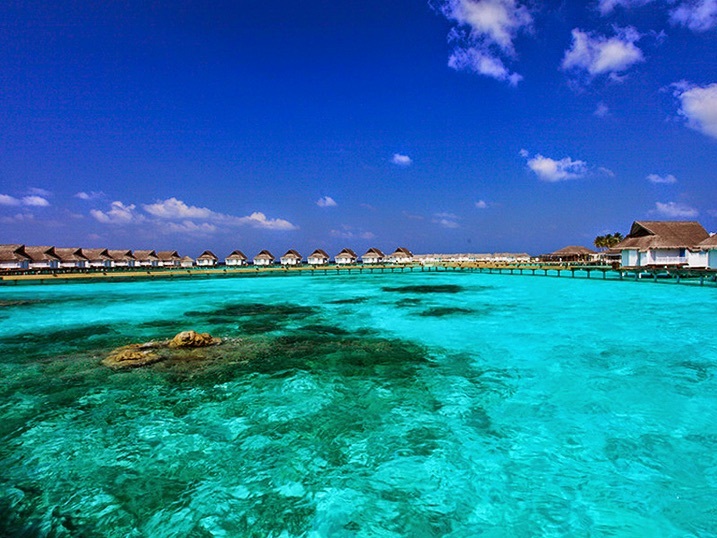 Reachable in about 25 minutes by domestic flight from Ibrahim Nasir International Airport, the island is located in the beautiful South Ari Atoll. Sun Island is the perfect tropical paradise that will make you one with nature and will never give you the chance to get bored. Approaching the island you will be awestruck by the seemingly endless turquoise lagoons and on the island you will be welcomed by its beautiful tropical greenery. The island’s roads and narrow pathways are lined with coconut palms, various types of trees and plants including flower gardens. Atmosphere in parts of the island fills with the sweet aroma of Pandan leaves. 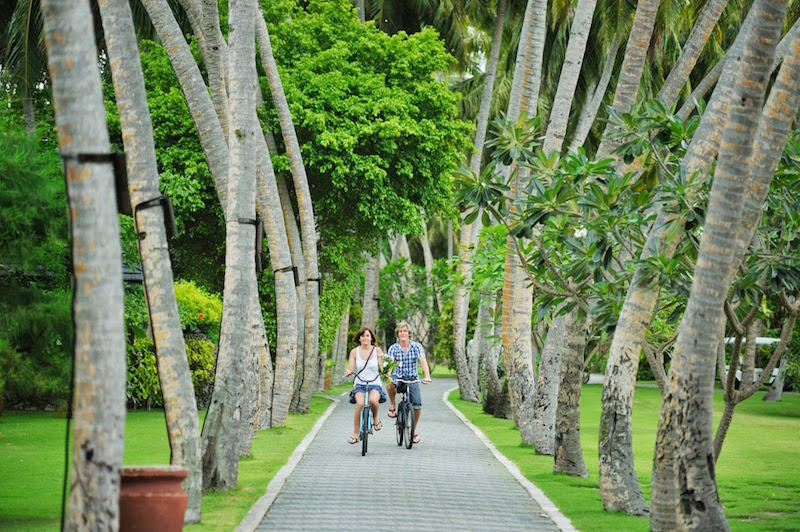 Sun Island is quite big and unless you are extremely fond of long walks, it would be ideal to rent a bicycle to explore the island. As you ride through this green island your senses will come alive. Unlike other resorts in the Maldives, Sun Island has a huge patch of untouched lush vegetation. The resort gives a high priority to maintaining the island’s natural beauty as well as growing its own tropical fruits and vegetable. Even if you choose to spend just a day on the island, Zero restaurant set in the heart of the island’s lush vegetation is a must-visit. The best of part of the restaurant is that you get to pick your own ingredients from the hydroponics garden and plantation behind the restaurant. 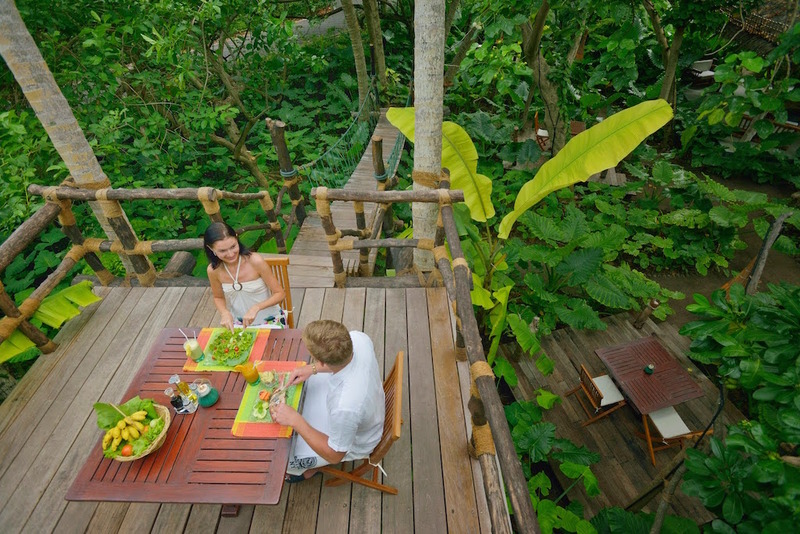 Sitting under huge trees, amid giant-leaved yam plants or at the exclusive table reachable by a hanging bridge on the treetop and enjoying a healthy, organic meal, you would become one with nature. If you are a romantic, the restaurant will provide the perfect setting for you at night for an intimate, romantic and healthy dining experience. The resort’s dedication to nature has won it several awards, including the National Award for the Green Resort twice and the Indian Ocean’s leading Green Resort during the World Travel Awards 2012. If you spend a couple of days in Sun Island Resort and Spa, enjoying and absorbing every bit of the island you would leave the island with a completely relaxed mind and body, with a greater appreciation for nature.